By 1870 settlement had begun in earnest. Storekeeper John C. McKellar opened the first store in the community that had been using the name Brooklyn, Texas. In 1873 residents applied for a post office under the name Brooklyn but it was rejected because Shelby Countians had thought of it first. 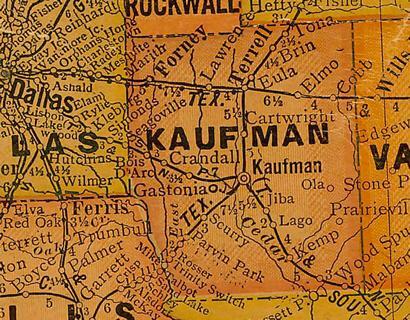 Also in 1873, the county seat of Kaufman, and the nearby town of Cedar Grove showed no interest in receiving a railroad connection from the Texas and Pacific Railroad, so the railroad came knocking at Forney's door. In need of a new name for their post office and to curry favor with the railroad, Brooklynites honored John W. Forney by naming the community after him. Forney was the railroad's civil engineer and the one who decided where the rails would be laid. The community led a tranquil life throughout the decades, gaining population over time. The 1960 census reported 3,000, just before work started on the Forney Reservoir (later renamed Lake Ray Hubbard). The 1980 census reported a population of 2,483 which increased to just over 4,000 for the 1990 census. It rose to 5,588 for the 2000 count, and 15,463 in 2010.